The rapid weakening of the dollar to which the dirham is pegged bodes well for Dubai’s real estate sector given its strong reliance on foreign consumer spending, analysts and real estate experts said. A weaker dirham, consequent to a weakening of the dollar, could be positive for the UAE economy as it is expected to boost the country’s tourism, retail, and real estate sectors that rely of foreign investors and consumers, analysts said. The greenback has depreciated rapidly in the first seven months of 2017 by up to six per cent, registering the longest period of deprecation since 2010. “Given the Dubai’s reliance on foreign consumer spending, this is likely to provide a boost to economic growth and may encourage firms to resume capital expenditure. This in turn may lead to increased employment which would translate into additional demand for commercial offices,” Knight Frank Dubai said in its Dubai Commercial Market Review. Matthew Reason, Senior Surveyor at Kinght Frank, said Dubai’s commercial market activity is expected to pick up in the latter half of the year with rental trends likely to continue their currently trajectory given the embedded supply dynamics. 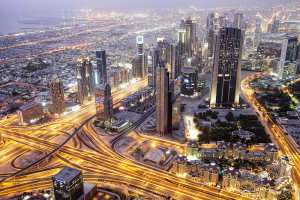 Dubai’s commercial market, which saw lacklustre performance in 2016 as a result of slower economic growth, is expected to benefit from a weak dirham by drawing more foreign buyers. “The strong dollar since May 2014 has proved to be a strong headwind for Dubai’s economy,” said Reason. Propertyfinder said in a report that while a strong dirham was good for expats sending currency home, it would make property more expensive for foreign investors and could drive up borrowing costs for residents. “A stronger dollar makes UAE property more expensive and less attractive for both locals and non-locals alike,” analyst at Propertyfinder said. Economists believe that the outlook for Dubai looks bright with the GDP growth expected to strengthen in 2018, bottoming out in 2017 at 2.2 per cent year on year and strengthening to 2.5 per cent in 2018. The dollar has depreciated rapidly in the first seven months of 2017, which is likely to provide further support for economic growth while employment is forecast to grow in Dubai by 1.6 per cent in both 2017 and 2018, Knight Frank said. In the year to second quarter 2017, on average, office rents across Dubai fell 4.5 per cent with the performance of prime and secondary markets continuing to diverge. High occupancy in prime markets will continue to support rents, which supports our view that prime rents will rise further this year. The delivery of additional Grade A stock will off-set any potential upside in rental values. In the citywide sector we expected pockets of outperformance to be sustained due to limited availability of good quality stock in preferred locations, however on average rental value are expected to continue to fall marginally. While Dubai’s economy is not as dramatically impacted by swings in oil prices, it is positive news for the region that prices have recently settled at around $50 per barrel, up from lows of $27 per barrel in January 2016. According to Knight Frank, prime rental performance in Dubai remained relatively stable with average rents shifting 1.3 per cent higher in the three months to June 2017. Demand in these locations remains high due to limited new supply, Freezone Status, international regulatory standards and the quality of local infrastructure. Grade A office market rents, which includes the following areas Downtown Burj Dubai, Sheikh Zayed Road and the Trade Centre District, fell 4.4 per cent year-on- year and two per cent over the last three months. Increased levels of supply and lower levels of demand have contributed to the fall in rental values, either via concessions or headline rates. In the city-wide market, the spectrum in quality of product has led to varying rates of both market performance and occupancy levels. On average rents fell 7.5 per cent in the citywide market in the year to June 2017 and 0.7 per cent over the three months, Knight Frank said. “Key locations where demand from occupiers is centred such as Internet City, Media City and Knowledge Park have maintained low vacancy rates ranging 2-3 per cent and therefore rents have remained relatively stable,” it said. In Business Bay, where supply continues to rise there is a downward trend in rental rates which has led to increased demand for space in strata titled buildings. “For the single ownership buildings in Business Bay we are witnessing increasing demand which has helped underpin price stability over the last year,” Knight Frank said.